Ranthambhore | The two new tigers cubs were spotted with their parents mother, Alcmene aka T-59 and father,(T-62) first time in Ranthambhore Tiger Reserve. 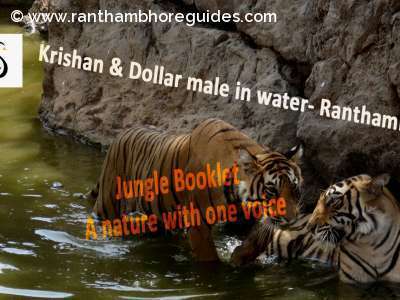 On Saturday morning safari, the rarest sighting happened in Ranthambhore, when two new tiger cubs were sighted in water hole including with mother, T-59 and father, T-62 in zone no. 9.These cubs should be ten months old. It must be 1st litter of them. This rare sighting was reported by the regular and enthusiast wild life photographer, Abhishek Chaudhary from Patna. The mother, Alcmene aka T-59 is quite young, shy and elusive tigress. She is sighted occasionally in zone no.9. by tourists. She is the daughter of T-31, mother. Indu aka T-31 is very large and shy female from Indala area. Usually the new tiger cubs always sight with their mother particularly the first time. But, it is different incident in Ranthambhore when the new tiger cubs sighted with their mother and father first time. The father, T-62 is quite mature, shy and elusive tiger who is sighted hardly by tourists in this area. He was reported first time, in June 2014. It seems that T-62 has settled down in zone no.9 and shared his territory with tigress T-59. It is quite clear that shy and elusive pair, (T-62) and tigress (T-59) have been living together for 3 or 4 years. 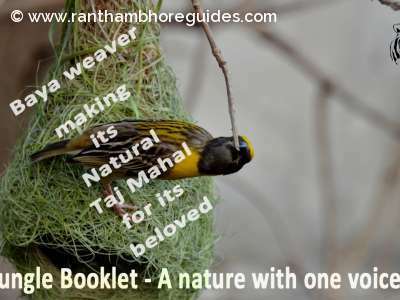 Due to their living relationship, they gave BIG SURPRISED for Ranthambhore Tiger Reserve and wild life lovers. In 2018, two young mothers, Arrow-Head and Lighting were also sighted with their new cubs first time. On 30 March, 2018, Lighting aka T-83 was sighted with her 2 cubs while her sister, Arrow-Head (T-84) was also sighted with her 2 cubs in zone no.2 on February 22, 2018.